We had crepes with banana's and nutella for breakfast yesterday with Brazilian coffee, it was great and then little Jasmine had a crepe with cheese for lunch another good finger food for little ones! My favourite American foods are pancakes, bagels, blueberries and cookies! oh and I adore Cajun and New Orleans Cuisine its fantastic definitely my favourite regional food, gumbo being number one! my fave american food are hamburgers and steaks! yumm..happy 4th of July! Apple pie and Lobster Boil. Enjoy the holiday weekend. Mac and Cheese and Apple pie?? Ugh, I rarely eat either of those. BBQ and hamburgers though, YUM! Blueberries are a great choice too, amen to that! Mac and cheese is definitely on my list. Then again so is everything on that list. Yumyum!! Peachkins: happy 4th I am a Brit so not really for me but what the heck !! 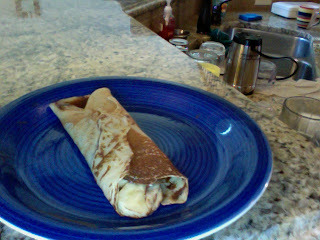 Crepes...I have never made them--are they really hard? My favorite American food? I can't decide - I love food so much!! Happy 4th! Have a great weekend! Hi, Rebecca! Thanks for comment in my blog. I love american food. I like pancakes, cheesecake, cookies... Yummm... I must to try mac and cheese!